Although probably very tricky to spot from a passing train on the main line, and mentioned briefly in my first ‘a view from the line‘ post about the little people, the shed area is hosting a couple of trainspotters. 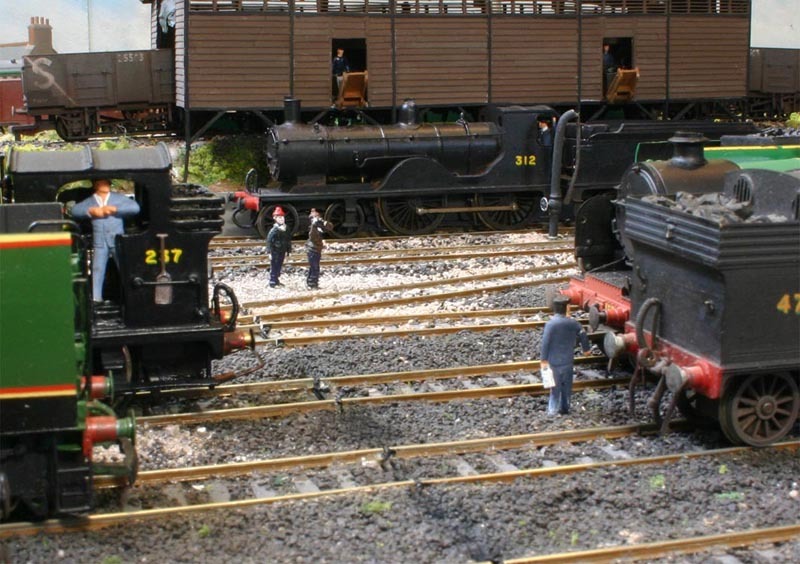 They are taking the opportunity to record and photograph the locomotives on shed being prepared for their turns. I can only assume that they must be armed with the letter of permission from the Head Office at Waterloo allowing them open access to the shed, as although they are being kept an eye on by one member of the shed staff they appear to be able to freely wonder around to taking photographs. My father and his fellow school mates never had the luxury of such official permission when trying to bunk the shed at Salisbury and therefore had to try and sneak in under the timekeepers office hatch on to the landing on the entrance steps and hope that a known or friendly member of the loco staff would turn a blind eye and stop them from being turfed out! 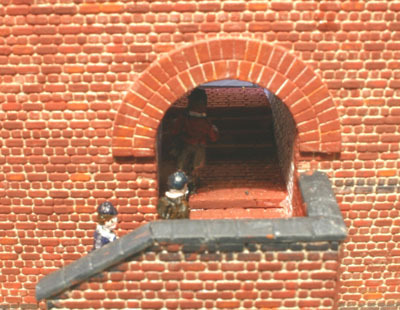 They are also imortalised on Fisherton Sarum just sneaking up the entrance steps of the shed and about to duck under the ‘ hatch’! The figures of the trainspotters I think were from the Dart Castings range. I use a mix of figures on Fisherton Sarum Dart Castings / Montys, Roger Stevens, Falcon Figures and Springside. The Dart Castings ones are generally the most detailed and nicely cast.